After three days of rain, we went out into the woods with high hopes, and we got some results. First we found the remnants of a small flush of black trumpets, on one side of the black trumpet mother lode. They were almost gone by, but we can’t be choosy this year, and we got enough to season a couple of dishes anyway. This find encouraged us to go farther afield. We took the scoot trail up the hill, which generally has something on it. All we found was the track of the fire department’s four wheeler from when they were searching for a fire earlier this summer. 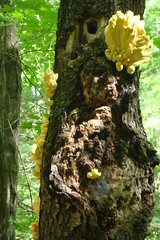 Coming back down however, we found a dead cherry with several pounds of chicken of the woods on it. We’ve only seen that once before, several years ago, and that one was too high for us to get. Lisa prepared some in a yummy cream sauce tonight and the rest is in the freezer. The texture of these is quite different than most mushrooms, much more like chicken than a mushroom, but the flavor is definitely mushroomy, and quite good. We’ve got enough for three more meals, plus we put the stemmy harder stuff in a separate bag in the freezer, and she’ll use it to make stock at some point. Finally we discovered a popple log with a flush of oyster mushrooms on it. I suspect that this last is the only actual result of the rain. However the ground now has water in it again, so we will try again this weekend: we could still get still get enough trumpets for us if not to sell. After we got back we ran the chipper for two trailer loads of chips. They definitely helped the mud in the horse’s yard. On a brain-dead bean-counting basis, we can’t actually justify spending the time on the chipper. I should just do some more programming and buy shavings for bedding. However if I did that, we’d also be looking for a way to dispose of slab and branches. Aside from burning feeling horribly ungreen, it too takes time. Between the taxes on a paycheck and the time spent otherwise disposing of the slash and slab I don’t honestly think we’re behind even on a strictly dollar denominated scale. The cheerleaders for the consumer economy are wizards at ignoring costs that go against their agenda. This entry was posted in Allium, Black Trumpet Mushroom, Farm Life, oyster, Pond scoop. Bookmark the permalink. Post a comment or leave a trackback: Trackback URL. 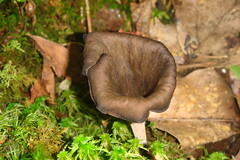 A couple of weeks ago, well before the rain, I found a few patches of black trumpets that had just gone by by air-drying, it seemed. I suppose because everything was so parched. Went out looking today, but am probably overeager, since the woods were still soaked. I’m wondering if the season is over for the trumpets, or if the moisture might kick them into action again. Any ideas? We’ve had trumpets up till the end of September in other years, so I’m hoping the rain will kick them off this year. However I’ve no actual knowledge, just a hope. Wow! Beautiful pictures. 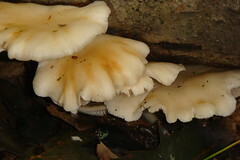 While I am fascinated to learn about the different ‘shrooms, and would love to reliably be able to identify some, I guess I am too freaked out by childhood tales of deadly poison, so I can’t get it out of my head. Could probably never eat anyting but the ones in blue styro boxes with cello casing!